Two obligately anaerobic sulfidogenic bacterial strains were isolated from the full-scale Thiopaq bioreactor in Lelystad (The Netherlands) removing H2S from biogas under oxygen-limiting and moderately haloalkaline conditions. Strain HSRB-L represents a dominant culturable sulfate-reducing bacterium in the reactor. It utilizes formate, H2 (with acetate as C-source) and lactate as e-donors, and sulfate, thiosulfate and sulfite as e-acceptors. It is haloalkalitolerant, with a pH range for lithotrophic growth from 7.5 to 9.7 (optimum at 8.5–9) and a salt range from 0.1 to 1.75 M total Na+ (optimum at 0.6 M). The strain is a member of the genus Desulfonatronum and is proposed as a novel species D. alkalitolerans. The second strain, strain HTRB-L1, represents a dominant thiosulfate/sulfur reducer in the reactor. It is an obligate anaerobe utilizing formate and H2 (with acetate as C-source), lactate, pyruvate and fumarate as e-donors, and thiosulfate (incomplete reduction), sulfur, arsenate and fumarate as e-acceptors. With lactate as e-donor it also grows as an ammonifyer in the presence of nitrate and nitrite. HTRB-L1 is haloalkalitolerant, with a pH range for lithotrophic growth from 7.1 to 9.7 (optimum at 8.5) and a salt range from 0.6 to 1.5 M total Na+ (optimum at 0.6 M). 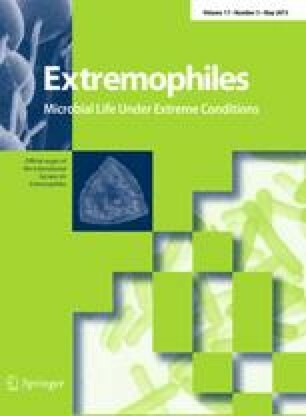 Phylogenetic analysis showed that strain HTRB-L1 is a novel species within the genus Sulfurospirillum (Epsilonproteobacteria) for which a name Sulfurospirillum alkalitolerans is proposed. Nucleotide sequence accession number: the GenBank/EMBL accession numbers of the 16S rRNA gene sequences of strains HSRB-LT and HTRB-L1T are GQ863488 and GQ863490, respectively. The online version of this article (doi: 10.1007/s00792-013-0538-4) contains supplementary material, which is available to authorized users. This work was supported by the RFBR Grant 13-04-00049 to DS, and by an Advanced ERC Grant to GM. We are grateful to Erik van Zessen for providing samples from the Thiopaq bioreactor.